It's Pinkie Pie and the yaks. I found the first foray with the yaks to be more interesting. Still, we get to see Equestria is not so different from the real world. If you're chummy with those in power you can be given official positions with no oversight. Perhaps Canterlot needs to send a special council to investigate irregularities in Twilight's administration. Two words. Punk. Rarity. That is cool! Of course to get there we have to go through some mostly mediocre interactions with the exception of a really cool scene with Zecora. In this episode we learn that manes are basically magic immune. This only makes sense as a contrived plot point, especially since, even early in the show, Twilight was able to create moustaches with magic. It's hard to say if this is really better or worse than It Isn't The Mane Thing About You but, in the end, two things pushed it up for me. The goth pony designer and that excellent scene with Strawberry Sunrise! This season had more than one occasion with Applejack learning that apples are not the favoured food of everypony. First off, the plot here is ridiculous. Neither Twilight nor Spike nor even Starlight seem to realise that hiding Ember and Thorax from one another is really dumb. Also it's a Spike episode… However, the situations with Ember and Thorax are really interesting and do build the world nicely. In addition, Spike got his well-deserved comeuppance and his friends solved each other's problems in a really natural way. Lastly, I can't be the only one that saw how well Spike and Ember would fit as a couple. I was totally on board with this episode right up until the climax. I loved Pinkie's narration of Daring Do's woes, I loved seeing the impact Daring Do had on other ponies and I loved the legend of Somnambula. Then there was that leap of faith… That was stupidity, not even faith. Even with religion, believers have a reason for their faith. 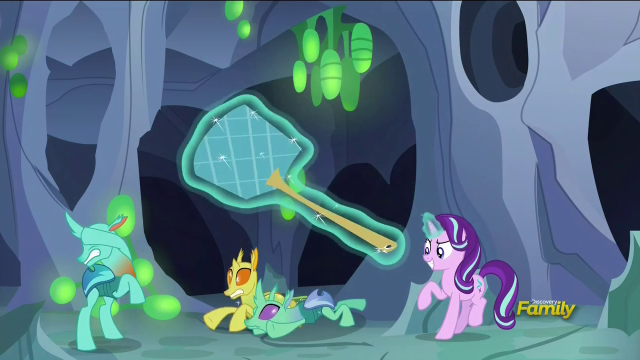 Pinkie Pie and Daring Do had no reason to believe there was anything other than green slime beneath them. The air spouts that saved them don't even make sense! The climax was terrible, especially when you have a cool tomb raiding pony to use, the lesson was bad and it veered way too close to the awful Feeling Pinkie Keen which I only got over and could genuinely start liking Pinkie Pie about last year. More legends of Equestria. I'm glad we squeezed three together instead of drawing them out into more poor episodes. As it is, the legend of Rockhoof makes no sense and Flash Magnus' story is nothing special (although the fire surfing was cool). Surprisingly, since I dislike Rarity, her story of Mistmane was by far the best and I might've enjoyed that story being stretched out to a full episode. The season finale. It focussed on the six pillars of Equestria and, like all the episodes telling the legends, was quite mediocre. Part 1 was the worst. It had the same rushed feel as the season 3 finale but without the pay off. They could've made each item have it's own episode, like the keys from season 4, and be collected when the legends were told. Alternatively, they could've just skipped the items altogether. Either way they would've had more time to build up the personality of the pillars and create a connection with the audience. Part 2 picks up a bit but it never really flows. There are too many characters for them all to matter and we have no time to develop a connection to any of them. Twilight has done something stupid, like in the movie (reviewed on Flayrah), but, at least here, her motivations and actions are believable. Starlight was excellent throughout the finale but that wasn't enough to really make me care about what was happening. Overall I found it disappointing and consider it to be the weakest finale since season 1. The episode that sank the ships; I hadn't invested anything in those particular ships so that meant little to me. I found this episode relatively entertaining if slightly cringy at times. 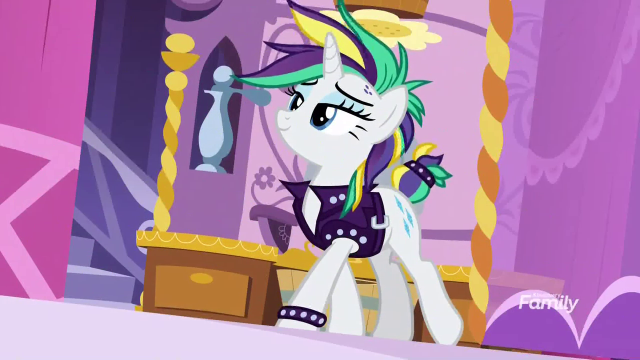 Sugarbelle was adorable and I found Featherbangs to be incredibly cute. It's not an amazing episode but it was enjoyable. This marks the beginning of the good episodes. Celestial Advice is unique as a season opener as it's the only one which is not a two-parter and neither does it have a villain. We do get the heart-stopping threat that Starlight will leave but, thankfully, that turns out to just be a fake out and allows us to enjoy Twilight imagining different scenarios for Starlight's future. Usually I'm not a fan of baby-focussed episodes; babies are usually messy and gross but all of that is dispatched with early in the episode and instead we get to see Twilight neglect her niece. This episode made me like Flurry Heart as we see she is not just a selfish baby but tries to do the right thing in her own, limited, ways. There is also a nice dig at the pretension of modern art which I can certainly get behind. This is the Fluttershy episode we really needed! There's a good showing from both Fluttershy and Discord with some nice new background ponies being introduced. This episode offers an opportunity to see how much Fluttershy and Discord really care for each other. The only criticism is that it's not so much a Fluttershy and Discord episode as it is half of a Discord episode followed by half of a Fluttershy episode. In one sense this is actually the start of the finale but that link is left until the very end. It's nice to see Starlight and all her friends again as well as a number of call backs to previous episodes. I could certainly relate to Starlight in this episode as I have had the same experience before which only adds to the empathy with the characters. This last comment is specifically to reactors, how are you all missing that Boulder uses the Mirror Pool!? 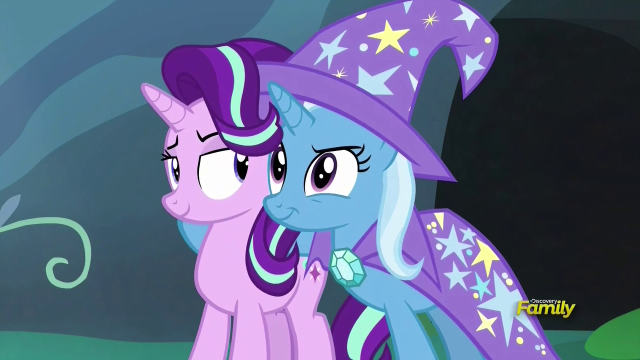 I am fully aboard the Starlight/Trixie ship and this episode plays right into that. Lots of great interaction between the two as we see how self-absorbed Trixie can be, even when she cares, and how far Starlight will go to forgive her. The message itself is also a good one that I'm sure we can all find applicable. While I felt a bit sad that we didn't see the return of Pinkamina, this episode is full of Pinkie's crazy antics as she tries to catch Rainbow in the act of lying to her. I like how this episode shows that both characters have good motivations and neither is really completely in the wrong. That, combined with some hilarious scenes, makes it extremely enjoyable. It was nice to see a new background character fleshed out and Rumble also introduces us to a whole new way of seeing cutie marks. While it may have been a flawed view, "Everypony has their reasons for doing things." I really liked how Kettlecorn tried to disavow her haiku cutie mark in the form of a haiku! Rumble's song was also incredibly catchy. Blank flanks forever! Similar to Fame and Misfortune, Once Upon a Zeppelin shows Twilight wrestling with the realities of fame that her position as a princess brings. Most of that reality is the uncomfortably close shadowing from Star Tracker as part of a prize. It's easy to sympathise with Twilight while also laughing at the situations she is placed in. There are also good appearances by Flurry Heart, the return of Iron Will and we learn that Twilight Velvet is not too shabby with her magic either. So much to love here. We finally see Rainbow Dash's parents and learn why she doesn't keep them in the loop and Scootaloo's hero worship of Rainbow is tested when they don't see eye-to-eye on certain things. Some ponies would dream of having parents like Rainbow's but don't worry Scoots; Rainbow and her parents will be there for you. In all around rock solid episode. (I'm sorry!) I like both Starlight and Maud so seeing the two of them together, along with Pinkie Pie, is really a treat. There are too many adorable or funny moments to really single out any particular one but, because of how cool it is, seeing how Maud and Starlight originally met and Pinkie's rather ominous instructions to keep that from being common knowledge would have to be my highlight of the episode. The map is only calling one pony and that pony is Starlight Glimmer! Excellent showing by Starlight and Twilight and full of exciting concepts. Luna's nightmare is suitably scary and the growing enmity between the sisters makes perfect sense. While I know many found Daybreaker to be the highlight of the episode, for me, nothing beat the moment when Starlight actually swapped the princesses' cutie marks. Instant regret but it all worked out in the end. Starlight and Trixie are back! I think this was also the first episode to not feature any of either the Mane 6 or the Cutie Mark Crusaders. Instead, we get Starlight and Trixie playing off each other incredibly well as they try to solve Thorax's problem of a rouge changeling. Starlight's plan originally fails, as they all seem to, but, in the end, it all turns out for the best. This was undoubtedly the pair's best adventure together and an episode as fun and re-watchable as this definitely deserves the number 3 spot. This episode has some similarity to the 100th episode but instead focuses on the more problematic elements of fandoms and celebrity culture. It is the most meta episode the show has ever had but contains a number of great commentaries on how fandoms in general, and the brony fandom in particular, sometimes overstep the line. After a hilarious ride and a song which comes out of nowhere it does end on a more positive note; reminding creators everywhere that it only takes reaching one or two people with your work to make everything worth it. One suspects this was a form of catharsis for the producers. Finally we get to see Applejack's parents! This was something everyone had wondered about for seven years! When it finally came, we got to see an amazing love story that I'm sure made everyone jealous of the pair. Don't we all wish we had that sort of relationship with someone? The majority of the episode was well-paced, completely adorable, emotional and included a beautiful song. It suffers a little with the rapid resolution after Applejack, Applebloom and Big Mac confront their grandparents but it does end on a very touching moment which makes up for the very minor flaws. It was definitely the best episode of the season!